I am a July 2014 graduate of the National School of Landscape Architecture of Versailles in France, where I studied landscape architecture for seven years. I like this field because each project is different, and we can work on different kinds of spaces and scales; park and garden projects, or public space (square, street, district) studies for cities or larger territories. For my diploma, I worked on a landscape project for salt marshes in a huge area in the south of France. I chose to do an internship here in the United States to learn more about plants and the American garden culture. This internship was initiated by the French Heritage Society, which has organized student exchanges between France and the United States for the past 30 years. I am here through a partnership with the Chicago Botanic Garden and the Ragdale Foundation, an artists’ community in Lake Forest. 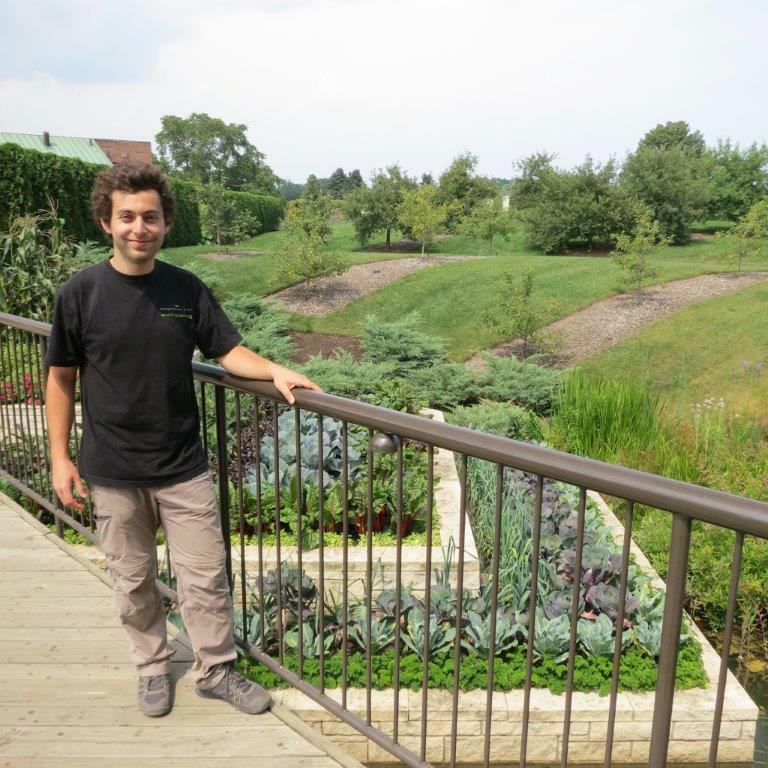 I spent four weeks at the Regenstein Fruit & Vegetable Garden at the Chicago Botanic Garden working under that garden’s horticulturist, Lisa Hilgenberg. The team was great, and it was a really interesting experience to discover new vegetable species or new ways of maintenance. I have done similar internships before, like in the kitchen garden of the King in Versailles, or at Potager du Roi, but those were not educational vegetable gardens like the one here in Glencoe. The Chicago Botanic Garden is wonderful, and I appreciate particularly the quality and variety of its vegetal compositions. Generally, I’m very impressed by the work of American gardeners and landscape architects. They are perfectionists. 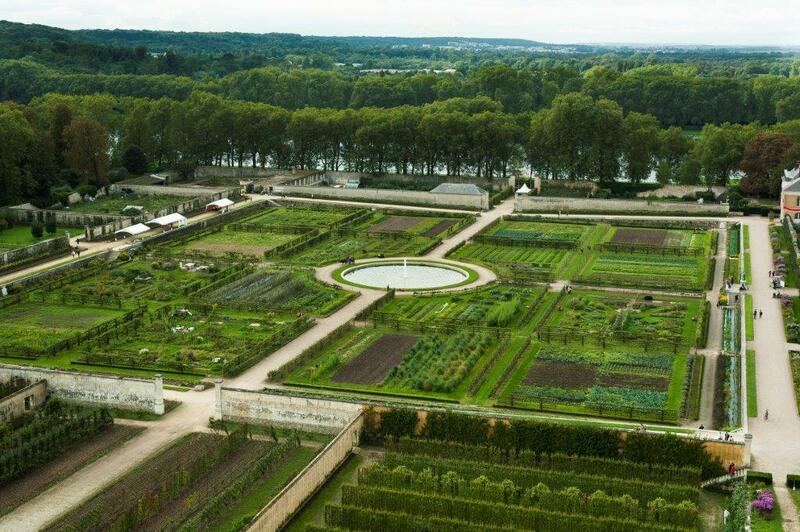 The Grand Square of Potager du Roi. This three-hectare garden is composed of 16 squares bordered by espalier pear trees that are grown upon support frameworks. The majority of the garden’s vegetable plants is located within this area. « Potager du Roi » par Paris Histoire — Travail personnel. Sous licence CC BY-SA 3.0 via Wikimedia Commons. When I was not at the Chicago Botanic Garden, I worked at the Ragdale House to help with the volunteer gardeners. It’s a historic garden designed by the famous architect Howard Van Doren Shaw at the end of the nineteenth century. Uses of the garden have changed since then, and there are different kinds of challenges for the maintenance today. I was asked to design a project for the garden as part of my internship. During this process, the prairie was a source of inspiration for me, as it is a typical landscape of Illinois. My main goal was to find a new link between the house, the garden, and the prairie, and I chose prairie native plants for a lower maintenance in the flower beds. 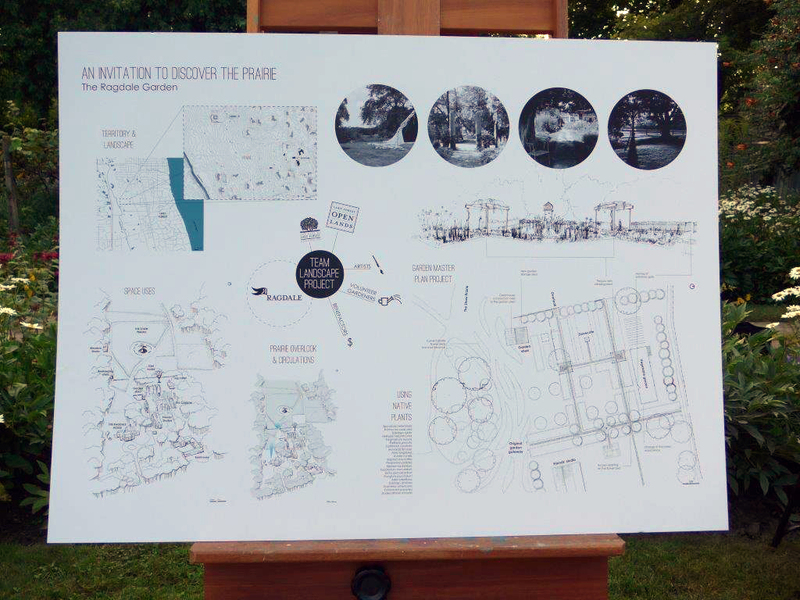 The finished project/proposal for Ragdale is displayed at its Benefactors’ Garden Party. Low-maintenance native plants create a link between the house, the garden, and the prairie. My stay at Lake Forest and Glencoe was an enriching exchange with the gardeners and the artists, and I hope that it will be the beginning of a new relationship in the coming years. It is always interesting to see how a “foreign professional” looks at our art, architecture and landscape. How this relationship gives birth to new ideas and opens up new horizons. Thanks Maxime, if you are still in Chicago would like to meet you. Best of luck for a bright blossoming future. Maxine looks like you have a wonderful passion! May I suggest the Flint Creek savannah in Barrington. CFC has done an incredible job in restoring the prairies sedges and Savannah. I wish you greatness in all you do! Would love to see a French garden someday. Interesting to hear from a Frenchman at the Chicago Botanic Garden whose layout itself was in part inspired by landscape architect Dan Kileys visits to Versaille.